According to this week’s “Grace Connections” e-newsletter, Grace Theological Seminary, Winona Lake, Indiana, will soon welcome Dr. Choong-Woong Jin and 20 students from the HolyWay Institute of Theology in South Korea, who arrive on campus on April 28 for three weeks of classes. This represents a partnership with HolyWay for the completion of Doctor of Ministry and Doctor of Missiology degrees at Grace Seminary. The HolyWay partnership is in its 11th year with Grace. Next year it will be joined by students from a second partnership that Grace now has with the Grace Graduate School of Intercultural Studies. Korean students from this additional partnership will come from mission fields in Russia, China, Mongolia, and Indonesia. 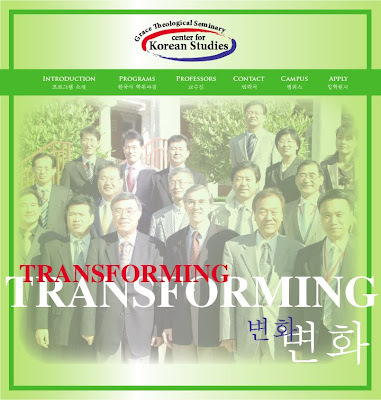 For more information on Grace Seminary’s Center for Korean Studies (Dr. Tom Stallter, Chairman), go to http://gts.grace.edu/Korean-Program/index.html.